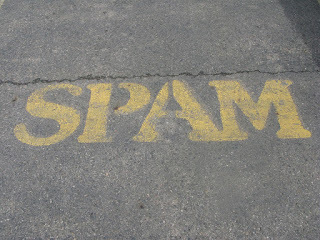 Experience: The Blog: What's Your Opinion: Can We Beat LinkedIn Spam with Direct Feedback? What's Your Opinion: Can We Beat LinkedIn Spam with Direct Feedback? Are you as tired of LinkedIn spam as I am? Some of you only connect with people you already know, and that is a recommended and smart strategy. I have traditionally adhered to a different strategy of following people I believe I would like to know. So, when someone reaches out to me on LinkedIn to connect, I may agree, even if I have not worked with or do not know the person. Yesterday, I connected with someone who is the founder of a social firm. I did not know him, but we seemed to share professional interests, so it seemed an appropriate connection for LinkedIn. Hi Augie, thanks for connecting with me. I hope you are doing well. I help people grow their businesses by marketing through digital and social media at SocialBlahBlahBlah.com. It looks as if you do as well. If there's ever anything I can do to help you, please let me know.Thanks again and have a great week! Now, I'll admit, by way of spam, it's pretty mild, but as we all know, spam is in the eye of the beholder, and my beholding eye was annoyed by this spammy intrusion in my LinkedIn inbox. I am going to disconnect from you, but I wanted you to know why. I followed you because, being a social professional, I thought you would share interesting content. I figured we might develop a relationship and, at some point in the future, we might have cause to get know each other, help one another and maybe even work together. The first day we were connected, you took the opportunity to spam me. To be sure, your spam was gently worded, but it's still spam. You took the opportunity to immediately talk about yourself and your company. This strategy strikes me as an oddly unsocial approach for a social professional. Perhaps it works, but I am so tired of getting spam on LinkedIn that I now immediately disconnect when a new connection tries to turn me into a "lead" instead of a "peer." Best of luck, but I wanted you to be aware your strategy of immediately spamming people with a message about your company had the opposite of the desire outcome with me. Is this fair? Helpful? Arrogant? And if we all did this, might it make a dent the spam we receive? What is your opinion? I'm one of those who's conservative about accepting or requesting connections on Linkedin. Nevertheless, I've been the recipient of unwanted advances. Your response was definitely not over-the-top. I think it was worded well, though the individual might be surprised be your reaction. Or, who knows, you might not even get a reaction or response. I don't feel as strongly about the message from your, now ex, connection. I don't think it was the smartest thing for them to do, but I would probably have not axed them until the next similar message. Also, those who have slightly more liberal connecting policies should probably expect to have to tolerate a little more. Linked In is business social networking and the whole point of connecting is just that, networking from a business perspective. That's why they have InMails - for making contact for business reasons. While the definition of SPAM is always in the eye of the beholder, he may have simply reached out to say thanks for connecting and because you seem to be in similar fields, if there's ever anything he can do for you to let him know. The only part that I thought made it spammy was including his web address - that should be part of his linked in profile and there's no need to include unless ....he was trying to get business from a recipient. I think I'd have been prone to let this first one go but if I received a second one, I'd have done exactly as you did. Let them know that you don't appreciate it etc. Thanks Billbean and Ron, I appreciate your input. Ron, I would challenge you a bit. I think intent speaks louder than content. When I see that message I was sent, I don't see a "thanks" but I see him introducing himself and his company. In the social era, we don't say "thanks" that way, and it is clear his intent was to fill his funnel, not send me a note of appreciation. This is an important point I'm trying to make--it is to easy to fall into bad habits in social media. The reason brands were so eager to adopt social 6 years ago and are now trying to figure out what to do with decreasing engagement is that they put themselves first. They were selfish, and consumers don't need selfish brands--or selfish sales people--in their lives. I just would urge you to consider what people make of the intent of your messages and posts. If you're honestly being helpful, informative and caring, that will shine through. But if it's all about putting your company and its services first, well, that will shine through, too. I think you're spot on. He can always reply and set things right.